I will try to assign Thursday as my release days. When I saw the 2009 Star Trek reboot, I was conflicted. Yes, the reboot did revitalize the franchise. Yes, it was decent on its own terms as an action film. Yes, it did feature the familiar symbols and characters. But it was weirdly distant from Gene Roddenberry’s original vision. It had many of the artifacts but almost none of the themes. The benevolent bureaucracy, the pacifism, the Prime Directive, the centrality of the fictional technologies and their workings to the plot, all gone. Instead, I got lens flare, epic space battles, gigantic starships being built in Iowa for storytelling purposes- thoughtless, albeit very enjoyable action. This post is about something like that. Last week, I tried to introduce several threads at once. Alongside the idea of a path-dependent, uncertain, impermanent technology tree, I also talked about how we tell stories around these mysterious artifacts that we find hanging around. I spent a few sentences defending the Rapa Nui people as being people and not lesser primates without agency. This week, I want to stress that although biologically these ancient people are like us, that doesn’t mean that the ways that they saw the world are grokkable to us. We can’t actually understand them as “thinking like us”. When I first saw the garish projections of what iconic Hellenistic statues would’ve looked like in their heyday, I was extremely disappointed. Truth be told, I really appreciated what time and the elements did to them. Sorry, Greek painters. 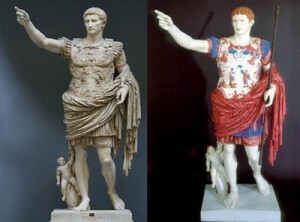 I’ve always thought the uncolored statues to be a more interesting, more enduring symbol of the culture. Without all of those strange colors, I could more easily see what I want to see when I imagine what they looked like back when they were new- maybe the same. Maybe with gold coating or something. When cultures die (or even just change too quickly), they sometimes leave behind artifacts without leaving most of their context. Sometimes other folks come along and re-appropriate an older group’s symbols or folk beliefs or technologies. Oftentimes artifacts are ignored or dismissed. Whitewashing: 1590s, “to wash a building surface with white liquid,” from white + wash. Figurative sense of “to cover up, conceal” is attested from 1762. Related: Whitewashed; whitewashing. The noun is recorded from 1690s. The characters of our narratives have become so familiar to us that we tend to simply view our ancestors as us, separated only by time. I have watched the siege of Troy, the burning of the library of Alexandria and Gladiatorial games all carried out with clipped British accents as though everyone living in the past 10,000 years spoke the queen’s English. What happens in the reshaping of history through our narrative lens is, if you will, a cultural-morphic personification. I think that in a way, the insane color schemes and the wide painted eyes ring tiny alarms to me, reminding me of how different they are. Biologically similar, yes, but very very different in outlook. And these are the same people that are an essential part of our collective cultural heritage. They are supposed to be “most like us” in some way. Stories are tweaked and sometimes engineered wholesale. Different environments can recolor them. New resources or constraints can constrain and evolve them differently as well- you could imagine methods for how an effective oral history can be constructed: maybe make it rhyme, or set it to some sort of rhythm, or force constant repetition to help it to stick, or make part of the telling ritual involve the audience in some memorable way. You could imagine how palm-leaf manuscripts in southern India, small and quick to fall apart, would spawn storytelling techniques that work in short/dense bursts, and perhaps even features interchangeable elements. There are hard constraints like material limitations, softer constraints like norms and expectations, and even difficult-to-detect constraints like cultural outlook (positive, progressive optimistic American narrative vs. pessimistic, traditionalist, backwards-looking Greek city-states) altering the stories we can even attempt to tell each other effectively. Which brings me back around to the Jared Diamond story in my last (or rather, first) post. What I saw in that theory, immediately, was a just-so story first, a moral tale, and an excellent one at that. We are destroying our planet to create idols to ourselves, and if we don’t stop soon it will be too late, etc. And it’s admittedly unfair not to try to take the story seriously as an attempt to connect the dots. But it’s the kind of story that says more about its teller than about its content. It presumes so much about the behavior of a people whose attitudes and behavior is largely unknown to us, separated by miles of ocean, centuries of time, and a very different history and culture and outlook. We can only guess what eccentricities are permanently erased from the record. I wonder how they painted their Moai? Next week: I’m done with ancient ruins for now. I want to write about familiar technologies and behavior change. I’ll use my talk here about stories constrained by their media as a launching point.